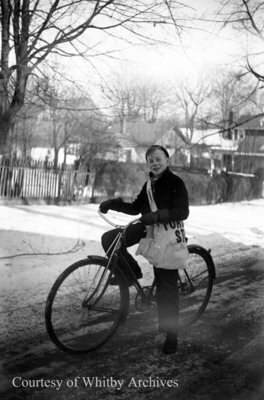 A black and white negative of Neil McCarl on a bicycle with a Toronto Star newspaper carrier bag. Neil McCarl was a newspaper carrier for the Toronto Star. Neil McCarl, December 18, 1940, Marjorie Ruddy. Whitby Archives A2013_040_737A.